When it comes to computers, business supplies, furniture, school supplies, and printer cartridges, Office Max coupons and promotional codes can help you save money. 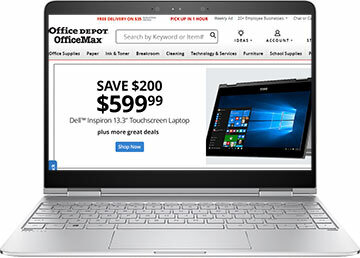 Browse our listings of OfficeMax coupon codes, sales promotions, advertised specials, and discount offers for deals on everything you need. Plus with OfficeMax.com coupons, you save a trip to the store. OfficeMax merged with Office Depot and the combined business is available at OfficeDepot.com. Therefore, we list all coupons now on our Office Depot coupons page. When techies think of places to buy their electronics, Office Max is not always the first store that comes to mind. Yet the company, with its long and reputable history as a retailer of office supplies, is actually a great place to find quality computers, computer accessories, software, and other technology. Founded in 1988, the company now offers a MaxPerks reward program that allows customers to save even more off of OfficeMax’s already low prices. At www.officemax.com, you‘ll find so much more than just paper, pens, pencils, envelopes, office furniture, breakroom and cleaning products, and other office supplies. The website also boasts a large home and business technology section, with everything from batteries and cables to cameras, copiers, and computers. Browse popular electronics brands from Kodak, Toshiba, and HP to Sony, Acer, and Apple. Music lovers will be able to purchase affordable MP3 players and MP3 accessories including iPod batteries, cases, and speakers. They sell GPS systems from Magellan, Nextar, Tom Tom, and Garmin. Get laptops, PCs, desktops, netbook computers, all-in-one computers, refurbished computers, and computer accessories at bargain prices. OfficeMax also stocks calculators, copiers, drives, memory storage devices, fax machines, memory cards, monitors, networking equipment, phones and headsets, scanners, and projectors. You will not only have access to an enormous selection of ink and toner, but to printers as well. Record your memories with one of OfficeMax’s low-priced digital cameras or digital video cameras from trusted manufactures such as Nikon, Olympus, Canon, and Samsung. You can even display your memories using a digital photo frame. Purchase video gaming equipment and gadgets including Sony PlayStation 3, Xbox 360, and Nintendo Wii game consoles. Click through an assortment of TV audio and video equipment from DVD/Blu Ray players to LCD TVs. The software section of the website stocks every category of software you could desire for your Mac or PC, including accounting, finance, and tax software. They sell anti-virus and internet security software, business and office programs, and games and entertainment software as well. Get graphic and design programs, learning and reference software, and systems utilities. You can shop software by brand, with selections from HR Block, Microsoft, TurboTax, Quickbooks, Quicken, and more.